Dr. Robert Linton is a spinal ligament injury specialist providing effective treatment for patients in Mt. Sterling, KY.
What is a Spinal Ligament Injury? ​our spine is held together by strong fibrous bands called ligaments, which protect the nerves and support the stability of the spine. When these ligaments are stretched too far or too quickly, the ligaments can become strained, torn, or damaged, resulting in spinal ligament injury. This can result in inflammation and persistent pain. Spinal ligament injuries are commonly caused by motor vehicle collisions, sports accidents, or other traumatic events. Neck pain, whiplash, and other spinal problems after an auto accident are often caused by spinal ligament sprain, facet joint damage, disc herniation, or spinal fractures. During a rear-end auto collision, your torso moves away from the seat while your head stays in place. This difference in motion causes the vertebral bodies to be forced in opposite directions, resulting in shear forces that strain the ligaments of the cervical spine, or neck. This can weaken the ligaments of the neck, which may result in decreased functioning, pain, and spinal instability. The ligaments may also swell enough to place pressure on the surrounding nerves, resulting in additional pain and neurological dysfunction. The shearing motion of a rear-end collision can also damage the facet joints of the spine, which is another source of inflammation and pain. Disc herniation may also occur in a car crash if the cushions between the vertebrae, called discs, are damaged. Intervertebral discs are made up of a tough exterior and a soft "jelly-like" center. If the exterior is torn, the softer center can push out of the tougher exterior, irritating the surrounding spinal nerves. This pressure causes pain where the nerve pathway travels in the back, neck, leg, arm, or hand. 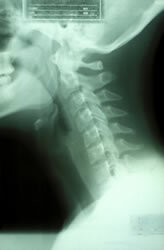 Spinal ligament injuries like whiplash cannot always be detected using standard imaging techniques. That means doctors may miss or delay diagnosis, leaving patients with long-term pain and ongoing symptoms. That's why it's imperative to find a doctor who specializes in spinal ligament injuries. Dr. Robert Linton has dedicated his career to the careful diagnosis and treatment of spinal ligament injuries and spinal instability. As a chiropractic orthopedist, he is skilled in using motion x-ray and advanced imaging techniques to locate and diagnose spinal ligament injuries. Studies show that up to 20% of whiplash patients experience chronic symptoms for up to ten years after an auto collision. At the same time, correct diagnosis and early treatment may minimize your risk of developing chronic pain after a spinal ligament injury. Chiropractic care and exercise rehabilitation, like what we provide for our Mt. Sterling patients, have been shown to relieve spinal ligament injuries such as whiplash and other auto injuries. Don't let your initial injury become a lifetime of pain. Dr. Linton has successfully helped patients recover from spinal ligament injuries in Mt. Sterling, Lexington, Winchester, Paris, Carlisle, Flemingsburg, Montgomery County, Menifee County, Powell County, Clark County, and Bath County. Call Linton Spine and Joint Chiropractic Center for an appointment today at (859) 499-1009.